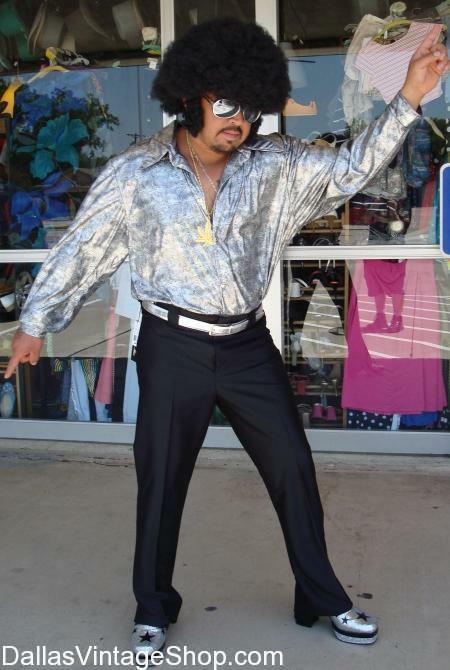 We have The Dallas, DFW and North Texas Area’s Largest Largest Collection of 1970’s Groovy Costumes, Men’s Disco Costumes and 70s Men’s Attire. Look at this 1970’s Groovy Disco Costume with 70’s Leather Fringe Vest. Dallas Vintage Shop has many of thousands of 70’s costumes and 70’s vintage clothing outfits for the 70’s. We have Vintage 70’s leather fringe vests, reproduction leather 70’s pants, 70’s Disco Dude vests, men’s 70’s polyester pants, men’s 70’s polyester shirts, Men’s 70’s Afro Wigs in many styles, men’s 70’s Shag Wigs, men’s feathered hair wigs, mens 70’s gold medallion necklaces, men’s 70’s aviator sunglasses, men’s 70’s zipper boots, men’s platform shoes for the 70’s and way more Cool 70’s Outfits than you can even imagine. Get High Quality 70’s Attire or Median and Economy Costumes for 70’s Theatrical Wardrobes and Costumes or 70’s Theme Parties. This 1971 Movie ‘Shaft’ Costume is just one of the thousands of Men’s 70’s Cool Costumes we keep in stock. Get all of your favorite 70’s Movie & TV Action Heroes Outfits, 70’s Historical Men’s Attire, Disco 70’s Men’s Period Clothing, 70’s Men’s Afro Wigs in a thousand styles and 70’s Men’s Sideburns too. This 70’s Shaft Costume is only a sample of the kind of 70’s Outfits that are plentiful here. Get Supreme Quality 1970’s Attire or Median and Economy Priced Theatrical and Theme Party Costumes and all the 70’s Costume Accessories you will ever need. There is no limit to the 70’s Costumes you can create here. We have the Largest and Most Diverse Collection of 70’s Vintage Clothing, 70’s Period Attire, 70’s Characters Complete Outfits, 70’s Wigs, 70’s Jewelry, 70’s Shoes, 70’s Facial Hair and the best Costume Ideas in the Dallas, DFW of North Texas Area. Dallas Vintage Shop is the Metroplex’s Most Comprehensive Collection of 1970’s Vintage Clothing & Accessories. However, we have the largest Selection of 70’s Reproduction Clothing in Dallas, made to fit modern sizes. These amazing Vintage Clothing Reproductions are Period Correct and perfect for Theatrical Wardrobes and Quality Theme Party Costumes. We have Men’s 1970’s Disco Jumpsuits,Men’s 1970’s Period Attire, Wigs, Platform Shoes, Aviator Sun Glasses, 70’s Ankle Zipper Boots, Men’s Disco 70’s Shirts, Butterfly Collar 70’s Shirts, Men’s Polyester Shirts & Suits, 70’s Complete Outfits, Men’s Peace and Zodiac Symbol Necklaces and more. Get Complete Outfits or just the pieces you need. Nobody has more 70’s Costumes & Vintage Attire than we do. Want your Mojo back baby? Groovy, then shag it out to Dallas Vintage Shop for very Shagadelic costumes, groovy clothing and really happening accessories. We can rock your world when it comes to Austin Powers Outfits. Do your own Austin Powers Outfit from any of the Austin Power movies. We can hook you up with any of the other Austin Powers Movie Characters too. There is no limit to the diversity and enormous quantity of 70s Men’s Disco Attire & 1970s Theme Party Costume Ideas here at Dallas Shop. In Stock always: Vintage Clothing, Retro Fashions, Vintage knock offs in XL and plus sizes and all the accessories you can imagine including many styles and colors of disco platform shoes, dozens of styles of Afros Wigs from small white guy perms to ridiculously huge and every length in between. There is blond, brown, black, red head and frosted Afros. We have long and short Jeri Curls, Dream Girls, Flips, Beehives, Go Go’s, Braids, Braids with Beads, Rasta and so many more. If you are in Dallas or not, and you need 70’s Clothing, 70’s Costumes or 70’s Vintage Attire with all 70’s Accessories you will ever need then Dallas Vintage Shop is the place for you. This post and this website, with its thousands of Outfits is only a sample of the Period Costume Ideas we have to offer. If you’ve never been in our store it would be impossible for you to comprehend the immense volume and encyclopedic variety of just the 1970’s Vintage Clothing, Costumes and Accessories we have in stock. That is true for any Decade or Century too. Please allow yourself one or two hours if you want to see everything available for the 70’s. You will find Large, XL or Plus Sizes in stock. Our employees are able to make Costume Suggestions for those who want suggestions. We want to help every customer create a look that is right for them. Get Supreme Quality 70’s Outfits or Median and Economy Priced Theatrical & Theme Party Costumes. Get the 1970’s Polyester Fashions for Men. Get this Scarface, Tony Montana Costume and other Movie Characters Outfits. Al Pacino plays a 1980’s Cuban Gangster in Miami who dresses like the Coolest Fashions of the 1970’s Tough Guys. 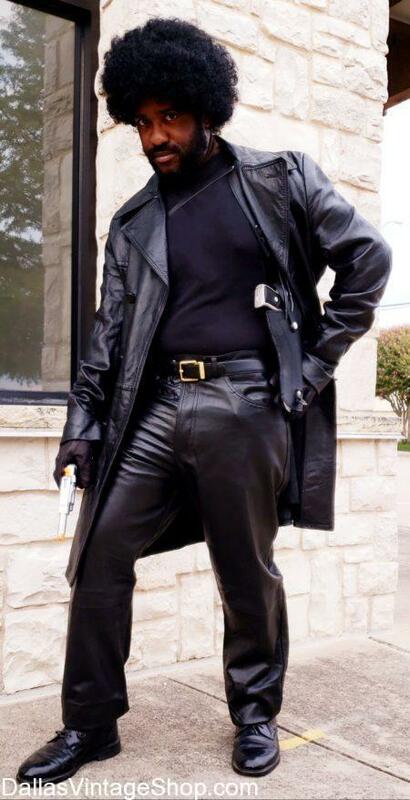 Who is your favorite Polyester Clad Action Movie Character? We have more 70’s Vintage Clothing, Costumes and Accessories than anyone in the Dallas, DFW or North Texas Area. There is no limit to the 70’s Outfits you can put together from our incredible collection of Polyester 70’s Suits, 70’s Shirts, 70’s Polyester Pants, White 70’s Zipper Boots & White Belts, 70’s Aviator Sunglasses, Men’s Shag Hairdo Wigs and all the 70’s Gold Chain Necklaces and other Men’s 70’s Jewelry that we have in stock. Get Supreme Quality 70’s Outfits or Median & Economy Theatrical or Theme Party Costumes and Accessories. We are open all year round. Are you ready for this 70s Retro Huggy Bear Outfit? 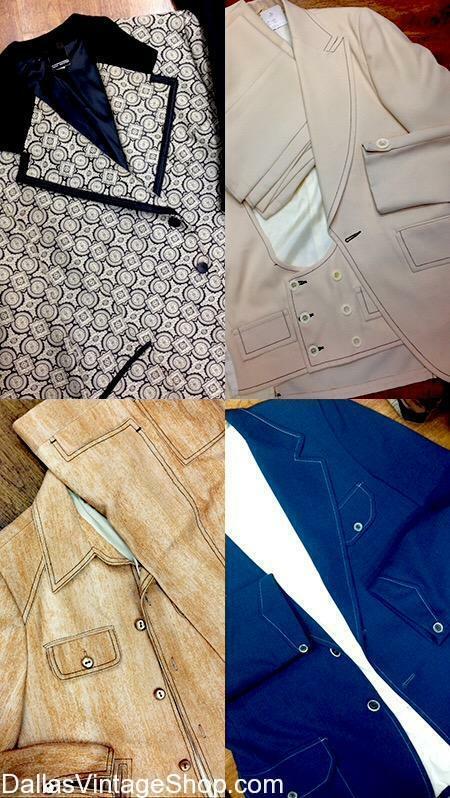 We have many, many 70s Leisure Suits & Polyester Suits. This one is also perfect for a Mardi Gras Disco King . We have an unbelievable volume & diverse selection of Men’s 70s Vintage Clothing & Accessories In Stock, all year round, in all sizes including Big & Tall, Plus & More waiting for you right now at Dallas Vintage Shop. You are in 1970s Men category.